Sylvie was born in 1956. As a child, she attended drawing courses at the Dijon college of Art. Arrived in Paris in 1973, she followed the drawing courses at the Academies Charpentier and the Grande Chaumière in Montparnasse. In 1976, she went into advertising illustration. She worked with several womens magazines (20 Ans, Marie-France, Marie-Claire, Cosmopolitan). The births of her three children punctually interrupted in 1977, 1980, and 1986 the first part of her professional career. In 1986, she decided to stop her activity in the Arts Appliqués. From 1986 to 1989, she attended the sculptor Manfredi Quartanas modelling lectures and learned how to model from life. In 1989, she met the sculptor Coutelle who taught her in his studio how to sculpt in the stone block. In 1994, she set up her own studio in Belleville in Paris. After taking part in several group exhibitions, she had for the first her own exhibition in the Selmersheim Gallery in Paris in 1995. In 1997,with Asnières town (92) she won her first public monument, dedicated to the Palatine Princess. Meanwhile, in the Nord-Pas-de-Calais several exhibitions and events started with the creation of the Bass player, carried out in the Marquise marble quarries (62). In 1998, within the context of corporate sponsorship, she was commissioned by the S.I.B. (Printing firm of Boulogne-sur-Mer) a sculpture made of Boulogne marble, Impressions and based on the firms brand image. At the end of 2000, she carried out a monumental sculpture made of Britain granite; this sculpture named Nature, has been privately commissioned. In April 2001, Concarneau town invited her for a personal exhibition. In January 2002, she carried out the posthumous portrait of M.A. Martinez made of Volvic lava. In November 2002, next to a personnal exhibition in the Histoire Naturelle Museum of Lille, the geology department purchased one of her sculpture made of Volvic lava named Trois Soeurs. In January 2003, La Maison Française dOxford(UK) invited her for a personnal exhibition. DAUM France edited her work of Art named KEA made of pâte de verre. In november 2003, the agricultural college of Coulogne (Pas-de-Calais, France) commissioned her for a portrait of Emile Dupuy Abbot, founder of the college. The sculpture is made of Boulonnais marble. In January 2004, Boulogne-sur-Mer council confides to her the realisation of two monumental sphinx made of Lanhelin granit to complete the Auguste Mariette monument. The Galerie-en-Ré of Bois-Colombes (92) shew her new works on the topic of the sea in December 2004 and March 2005. DAUM France edited a second work named “SOURIRE” made of “pâte de verre”in January 2005. She participated to the Artistic Exhibition of Rosenau in April 2005, of Landser in September 2005 in the Haut-Rhin and of Wimereux (62) under the sponsorship of Robert Zieba. The Marcel-Sahut Museum of Volvic invited her for a retrospective on sculptures cut in lava. In September 2005, her sculpture entitled “Sirène-Fleur” is selected for the “Salon de la Marine” in Paris. In October 2005 of the same year, the “Salon d’Automne” of Paris exhibited the sculpture “Amants Eternels”. The Taylor Foundation awards the « Sandoz Prize 2005 » to this sculpture. In june 2006, the Estaimpuis council in Belgium commissioned her for a monumental sculpture made of Boulonnais marble dedicated to « The Old Bargeman » 270 x 150 x 100 cm being in place on the roundabout Leers-Nord–Province of Hainaut. In November 2007, her sculpture entitled “Rendez-vous à Dogger Bank” is selected for the 40th Salon de la Marine in Paris. She received a congratulatory letter from the Secretary of State for Defence about this work of art in January 2008, as well as a special award by the panel of judges of the 9th Biennial Exhibition of Wildlife Sculptures in Rambouillet Castle park in september 2008. She participated to the Monumental Sculpture Exhibition organized by the Potassiumine of Alsace Company-Wittelsheim in june 2008. She received the Sculpture Medal of the 143 rd Salon de Versailles in December 2008. 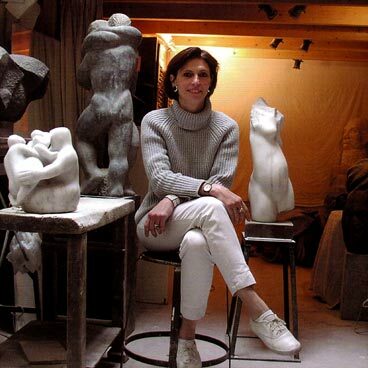 In February 2010, she participates to the group exhibition within the context “ SculpturELLES”, four women sculptors meeting. In July/August 2010, she participates to the group exhibition “SCULPTURES/Matières à rencontres” in the Public Library of Boulogne-sur-Mer (62) France. Today, Sylvie KOECHLIN lives and works near Boulogne-sur-Mer/ Pas-de-Calais in France. Member of the Salon d’Automne Society Paris. Member of the Taylor Foundation since 1997.